Tomorrow is my payday and it's making me feel a bit like this. This has been a super tough month financially, just from my move to England and having to tie up a few loose ends and bills etc from Belfast. So now I can finally get started on beautifying my yardspace! I have wanted a home with an enclosed yard for AGES and with this flat I finally have that. It's super tiny and all concrete but it's large enough for a few pots and a bit of garden furniture which is all I want. I have been obsessively combing Pinterest for ideas on how to make my little garden look lovelier and have seen a few great tips that I will definitely be utilising. I've also filled a basket on the Wilkinsin website which I intend on purchasing as soon as my bank clears my paycheque, with seeds, compost, a yard brush (so I can deck scrub the concrete! ), and a few colourful, large pots for planting. I want my garden to be colourful and fun, so I've purchased some marigold & antirrhinum seeds so I can grow some colourful flowers, as well as coriander (my fave) and rosemary, chillies, parsnips and broad beans. I would love some beautiful patio furniture too but that might have to wait for next payday. I also bought some sunflower seeds, and I'd love to get my hands on some giant allium seeds because they both grow so tall. I thought it would be an interesting way to make my small garden look bigger. 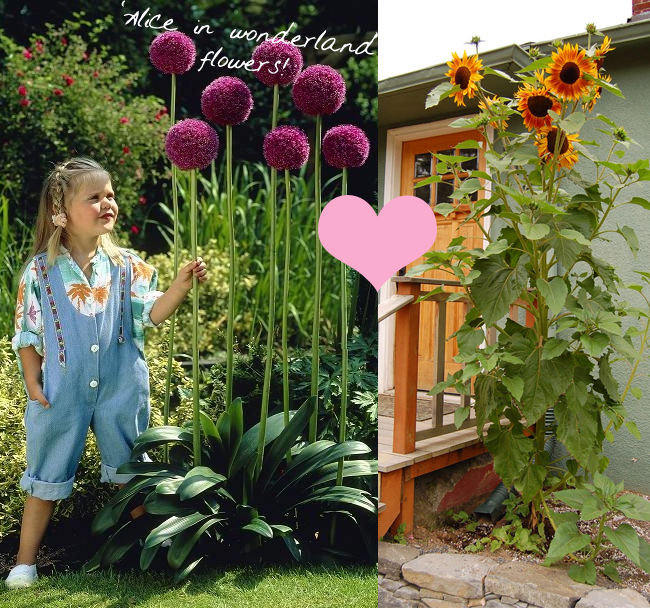 The whimsical size of the alliums, (as modelled by this 80s child wearing a totally on point dungaree/palm tree shirt combo) were apparently an inspiration for some of the imagery in Alice in Wonderland. One thing I am kind of excited about is that fact that the previous tenant left a load of bricks in my yard. 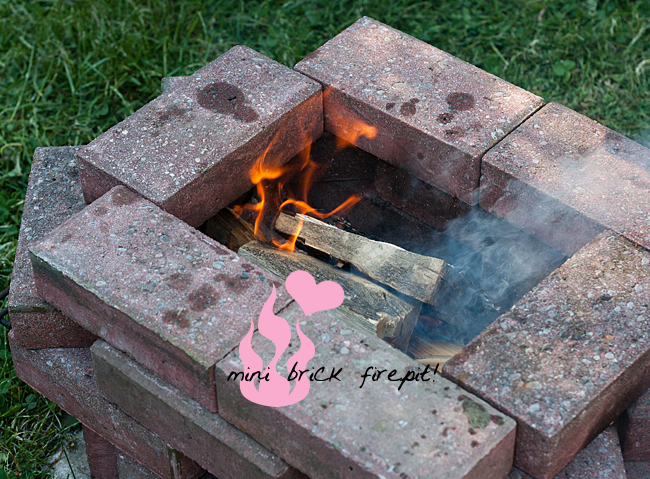 I didn't know what to do with them at first, and was thinking of making a flowerbed, but after have a poke around online at DIY firepits I DEFINITELY want to do that. The great thing about a firepit like this is you can use it just for warmth and atmosphere, but it also doubles as a barbeque too! There are some great tutorials online and step-by-step videos on youtube. This particular pit is from the BHH blog and their photos of the BBQ they had using it look so good! One thing Pinterest is GREAT for is gardening tips you otherwise wouldn't have know. 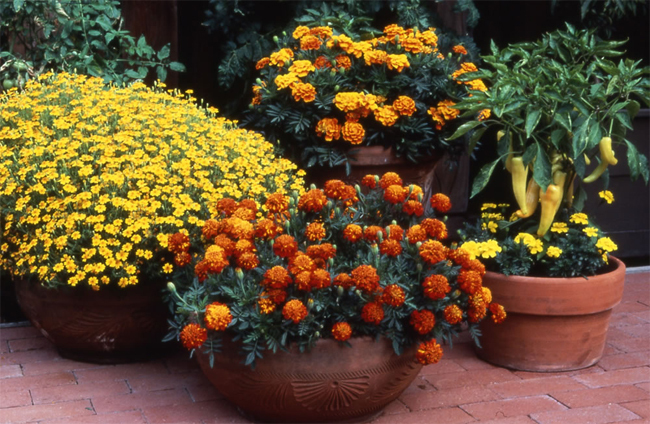 You can find out which plants work well when grown together and what veg grows best in containers (a great one for someone like me with no actual garden). I like these two though, how to make a portable greenhouse and starting seeds in eggshells. The mini greenhouse tip is from Garden Therapy, who actually uses a special collapsible greenhouse, but you could also use an umbrella if you couldn't find one of these, if you didn't mind it rusting and possibly not closing up again. The eggshell tip is from many different sources, just Google 'eggshell seed starters' and you'll see a whole bunch. The idea behind it is you can just plant the whole eggshell into your chosen pot and it composts naturally, giving your baby seedlings a nutrient rich start in life! 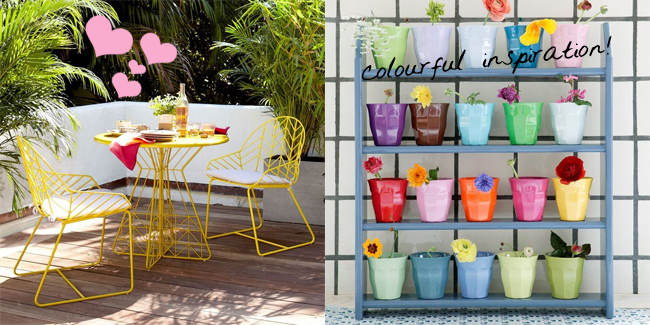 I have 3 days off over Easter, so I am hoping the weather stays as lovely as it has been so I can get outdoors and get working on creating the perfect, colourful urban garden, so I can throw some amazing summer barbeques! I have been struck down by a really nasty cold & had to call in sick to work for the first time in about 3 years on Saturday. Sooo, I've spent every day since then curled into a ball on my sofa, wrapped in my duvet, eating chicken soup, watching the Food Network, popping paracetamol every 6 hours, and drinking hot lemon and whiskey. I definitely think it has helped nursed me back to health though as today I finally feel a bit less like death, which is just in time because I go back to work tomorrow. It helps that my method for making chicken soup is the easiest thing in the world and is precisely the kind of thing that is perfect for when you're feeling a bit crap because it doesn't involve a lot of work. The end result is soothing, tasty and filling and you can just put it all in the fridge and reheat it bowl by bowl in the microwave. 1. in the bottom of your pot fry off the onion in a little olive oil until clear but not browned. 2. put everything else in your pot, cover with 1L of stock and let it simmer away until the chicken is cooked. 5. Remove from the heat and let it cool a bit. Skim off most of the fat from the top (you can skim it all off if you want but a little will help your soup taste better). 6. Butter some nice bread you got out of Tescos. Take your bowl of soup to the sofa and your duvet and try not to suffocate whilst eating due to inability to breathe out of nose. Wish your mum was there to fuss over you. Repeat for 3-5 days until healed. 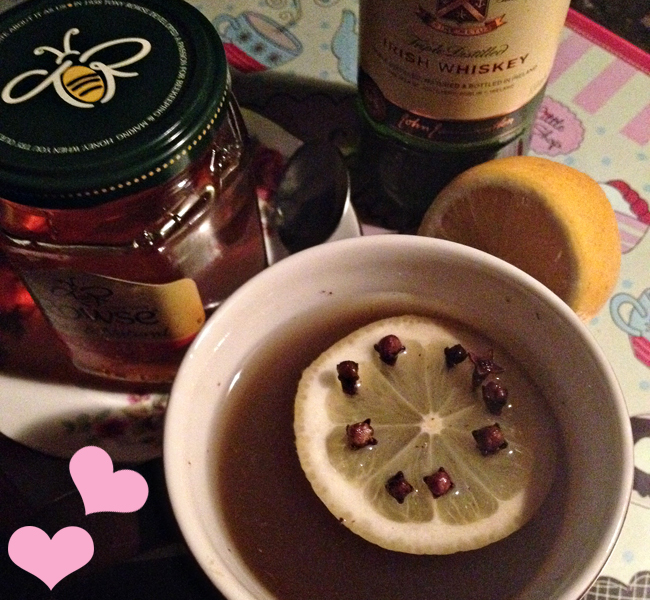 The other thing that has gotten me through this nasty bug, is of course the traditional Irish cure for cold & flu, hot whiskey. I'm not really a fan of whiskey, but it's quite nice served this way, and with a cold you can't taste much anyway so it takes the edge off. It smells comfortingly medicinal too. My dad will refuse all forms of medicine for a cold, but will allow my mum to make him a hot whiskey or two when he gets sick. He's normally back on his feet pretty quickly, and rarely gets sick in the first place, so this is why I believe in the healing power of this drink. 1. Stud your lemon slice with cloves. 2. Measure out your whiskey into your mug and add your honey. 3. Pour in your hot water and give it a stir. 4. Drop in your lemon. 5. Be healed by the power of Irish magic. This horrible cold seems to be affecting everyone, at least in my area. Hopefully none of you are struck down by it, but now if you are at least now you'll know how to nurse yourself back to health! I'm off to watch more Ina Garten & Ace of Cakes. I think I'll have another bowl of soup too.